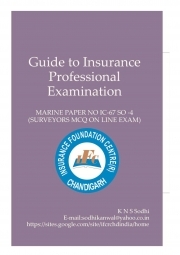 Description of "Guide To Insurance Professonal Examination (eBook)"
Helpful to Surveyors, Brokers, Insurance Professional, Officers preparing for promotional exams. Having for than 40 years years of experience in Insurance Education. Reviews of "Guide To Insurance Professonal Examination (eBook)"